This weeks Bloggers Challenge is color blocking. I wanted to incorporate something for the 4th of July Holiday, so my color blocking challenge has a patriotic theme. If you'd like to play along, just leave your blog link in the comments, or if you upload to SCS, use keyword BC54. Have a Safe & Happy 4th! Very patriotic cards, seen a few of them today. These are great cards Lisa, great examples of colour blocking. Wonderful cards, Lisa! Happy Independence Day to you! These are wonderful Lisa! I especially love the second one. That has always been a favorite technique of mine, and I have never even done it! Super job on these, I hope you enjoy your 4th! Lisa, love both cards..and like the scratch background on the first one. Warhole is one of my fav's. Great cards! Love them both! 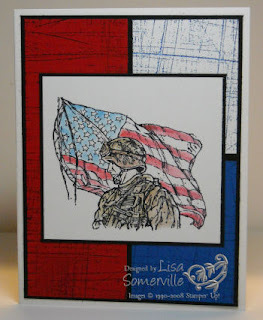 Both are fabulous cards, Lisa...so very patriotic and reminiscent of our heritage. Great job. Cute cards! i especially like the Warhol one. Great cards, Lisa. I really like the second one--love that stamp and the design. I love the R, W and B theme for both cards! The saluting boy is a fabulous stamp that is really highlighted with this tech! I absolutely love the soldier card! You really made it shine! Really great cards! - Patriotic was a good "theme" it seems. The card with the little boy is just adorable. Love both of these Lisa. The use of the sanded background is very effective. I think I need to go buy that "Hero" image, it's adorable! 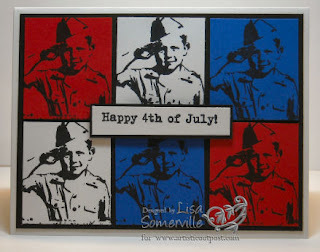 Love these patriotic cards! Both are great examples of color blocking.....sure glad I don't have to choose a favorite because they are both wonderful. Love these especially the bottom one. So very patriotic. Great cards, love the one of the boys!